This blog is on temporary hiatus. Initially computer issues stopped us from writing, but now we are both in the midst of finishing other projects. The trip in it's entirety will all eventually be covered. To be alerted about new posts contact us here to receive an email update. 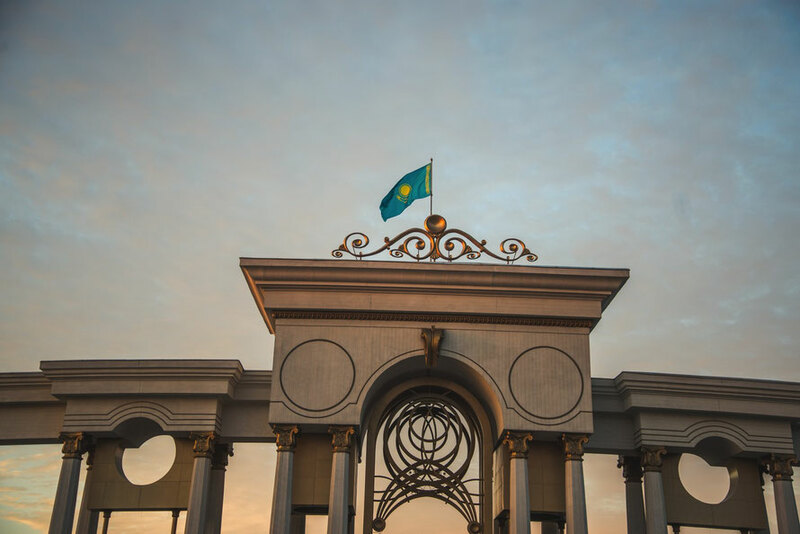 Uzbekistan gave us one of the warmest welcomes we’ve received, even with the notoriously strict Uzbekistan border control included. Despite being perhaps the biggest country for tourists in Central Asia, famous for it’s long, well-preserved history and its prominence on the silk road, the Uzbek government until recently was not too hot on the idea of having many outsiders unpatrolled inside the country. Motorcyclists coming the other way told us to factor in police checkpoints every 10km into our route planning, and since Kyrgyzstan we’d heard a collection of horror stories from other travellers about the border – from getting stuck in no-mans land to getting detained, put in prison and brought to trail for medicines with a prescription (codeine is illegal in Uzbekistan). But mostly we were told that things would be slow. Uzbek border guards tend search every item you plan to bring into the country, even going so far as to break apart the bread of a friend we talked to in Dushanbe. Dushanbe is much smaller than the other Central Asian capitals we’ve been to, quieter, and much more soviet. There are no real tall buildings so the skyline is dominated by a set of neo-classical pale yellow “twin towers” and the world’s now second-largest, 165 meter flagpole complete with a flag that apparently weighs 700 kilos. 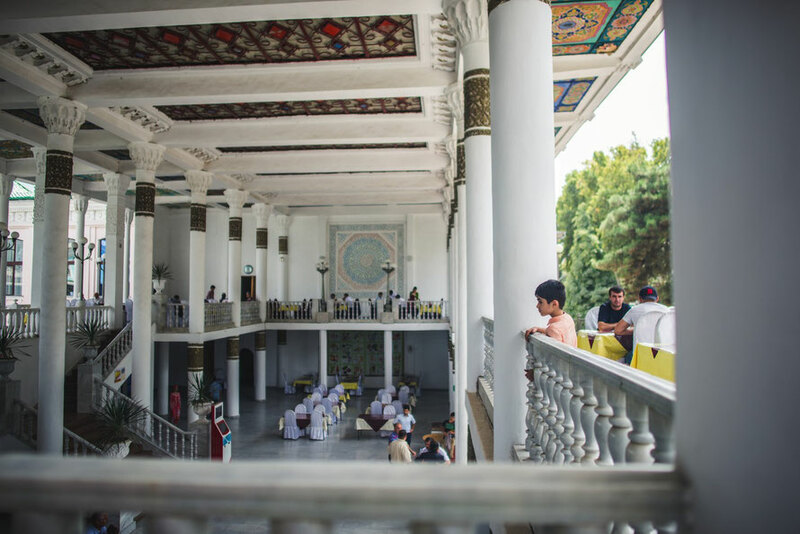 Authoritarian flair also shines through in some of Dushanbe’s boastfully ambitious projects such as the world’s biggest teahouse and a moon being named after it. 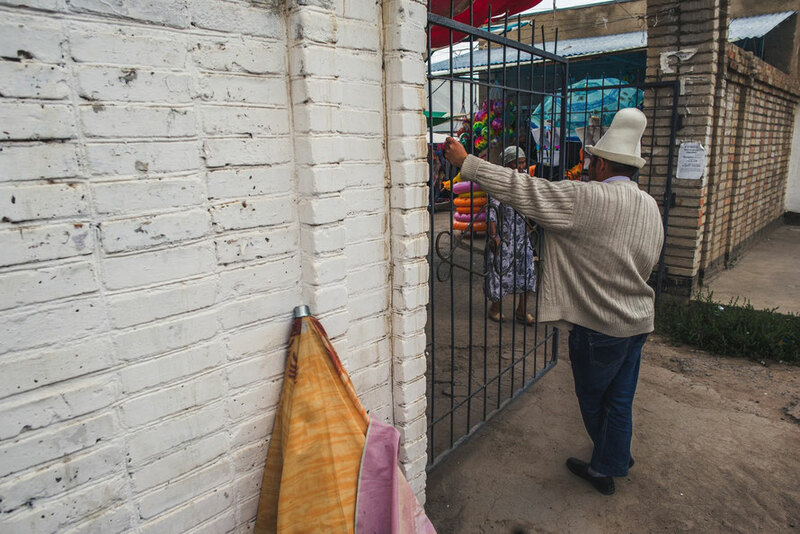 When we were there, Facebook was blocked because of backlash against the government when a man who had a birthday party –which is illegal in Tajikistan— posted pictures of it and then received a fine. Yet Dushanbe still managed to grow on us. 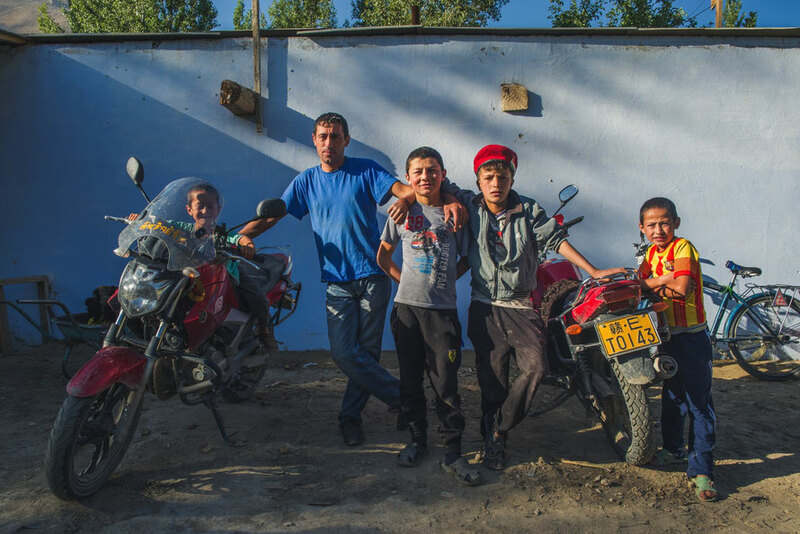 Slow days and new, close friends made the Tajik capital seem familiar and a chance to actually try to understand Tajikistan made a week waiting for visas into an opportunity to figure out what defines this country at Central Asia’s southern edge. I’m not sure either. In principle it doesn’t seem like a great idea to stay with drunk strangers, but not an hour ago we had been talking about how much of a shame it was that we’ve turned down so many other offers to stay at peoples homes. Sometimes we’re just blindly stuck to a preconceived plan, other times it’s just been way too early in the day. I reflect briefly and look over. 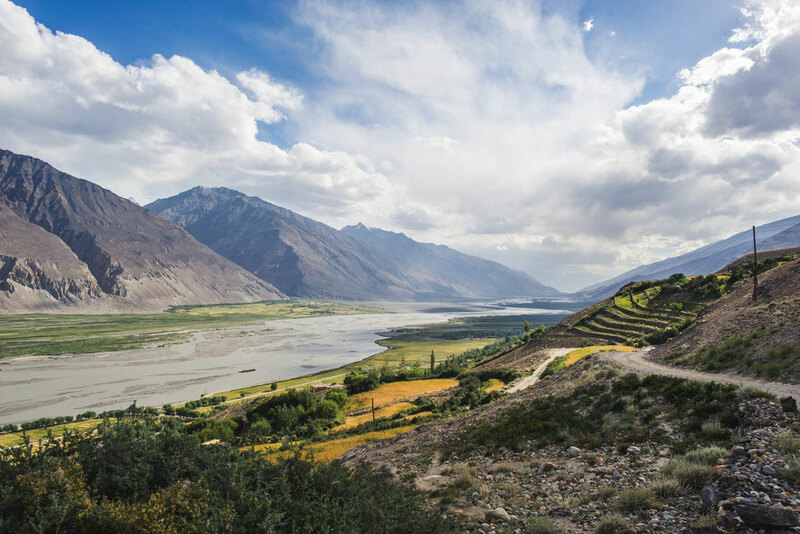 The Wakhan valley cuts the line between Tajikistan and Afghanistan along the broad grey waters of the Panj River. It’s a line that’s as arbitrary as many in post-Soviet Central Asia, drawn straight through the southern Pamir, leaving two sides of the same people feel as if they were completely different. It’s a border that winds and crawls through roads of sand and dirt in places they were never meant to go. It’s a path blasted through the rock on the Tajik side, one literally carved into the cliff on the Afghan side. 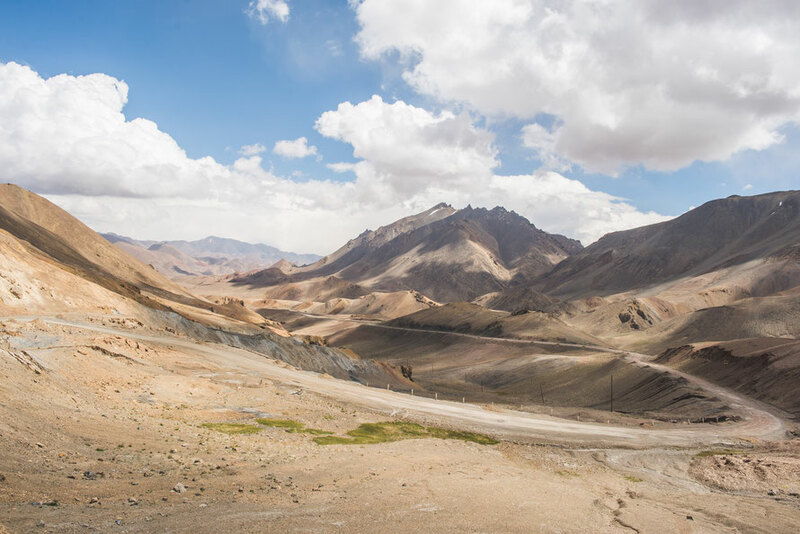 The Wakhan is completely different than the rest of the Pamir up until it. The desert red, brown, and khaki have been traded for a lush ochre, green and blue. The fields are full, framed by tenacious snow mountains that have pushed right up to the rivers edge. Houses burst forth in perfect complexions of white and pale turquoise. The roads are full of children that come out to not only wave but also dive into the road for high-fives. It might just be the most beautiful place I’ve ever been. A dreamscape realized. Conditions in the Pamir change fast and unforgivingly. Just like Tibet last month, the weather at altitude whips and flows through the valley in quick spurts and intense torrents. 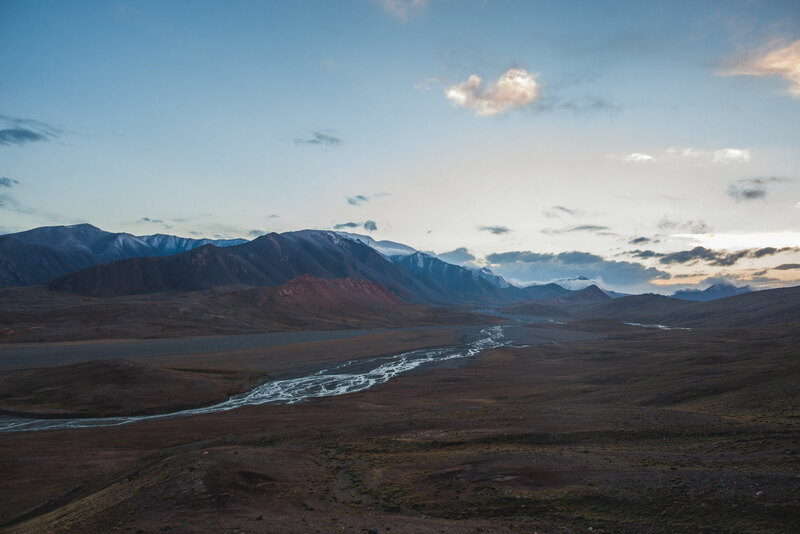 The first day in the Pamir starts off like the last day in Kyrgyzstan ended: we wake up to a bright sun, but are quickly covered in hail, freezing rain and snow –none of which last for more than ten minutes. 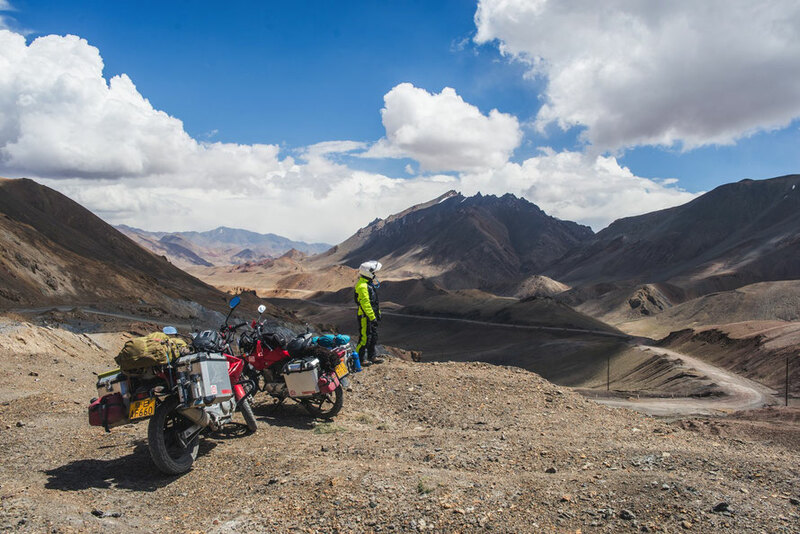 Unlike Tibet though, the road in the Pamir is as fickle as the weather. From Karakol the Murghab, the road is mostly paved, which to be honest is surprising to both of us; however, it’s definitely not paved well, and sudden, deep potholes at 60km go about as you would expect. Other times the road devolves suddenly into rocks. At it’s worst it’s like an amalgamation of small river stones where you slide and skid at the slightest turn of the handlebars. I can’t blame the roads themselves though, life out here, constantly fighting the elements is bound take its toll. On long pavement stretches we come across multiple places where the tarmac has fallen out a large chunks; this might just be a place that people were never meant to go, a part of nature that was never meant to be conquered. The eastern Pamir is one of the most remote and inhospitable places on the planet. In our first day here we get snowed on twice, hailed on twice, rained on intermittently and have crossed three rivers on washed out roads. But the psychical battle is not the most prominent feeling on entering the Pamir. Instead it’s the overwhelmingly alien ambiance of the place. The isolation and desperation of entering somewhere that doesn’t feel like it belongs on this earth. As we crest over the ridge out of the Tajik border at Kyzyl-Art it’s this feeling that sinks through the marrow of my bones. At dusk about 20km outside of Jal-al-abad we’ve stopped on the side of road when a brilliant baby blue Soyuz motorcycle drives past us with a sidecar full of hay. The driver waves to us as he goes by and we jump on our bikes to catch him; there are barely any motorcycles in Kyrgyzstan, let alone ones this cool that run so well. I come up next to him and we motion for him to pull over. He obliges with a smile. Coming down from Song-Kul is nothing less than breathtaking. The southern side of the lake in and of itself is picture perfect, but the ride down into the valley is even better, if partially because it comes as such a surprise. The scenery in Kyrgyzstan changes faster than any country we’ve been in and is some of the most impressive we’ve seen. Central Kyrgyzstan is full of great campsites, great people, beautiful drives –and tiring roads; it’s been one of my favorite sections of the trip so far. 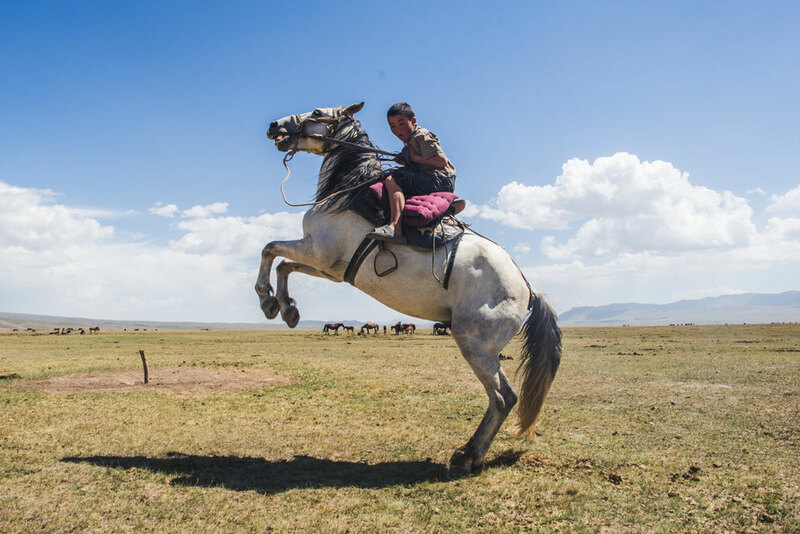 Janabai is 30, has four kids, 46 horses, and a ton of sheep. He’s wearing an unzipped sweater and a worn Yankees hat. His bottom teeth are perfectly straight; two are capped in gold. When we pull up to the side of his yurt, he welcomes us like family. “Sit here so the sheep won’t run out,” he tells Jie immediately after shaking hands. Janabai and his father, whose entire mouth is gold teeth, are busy trying to get the herd into a chicken-wire pen on the edge of a small waterway. Jie sits down, but when the sheep keep coming out and not in, he tries to get up to move the flock with his arms. From across the riverbed Janabai motions with his hands: sit back down. We may be part of the family, but we still have a lot to learn about our chores. Central Asia is the birthplace of eagle hunting. 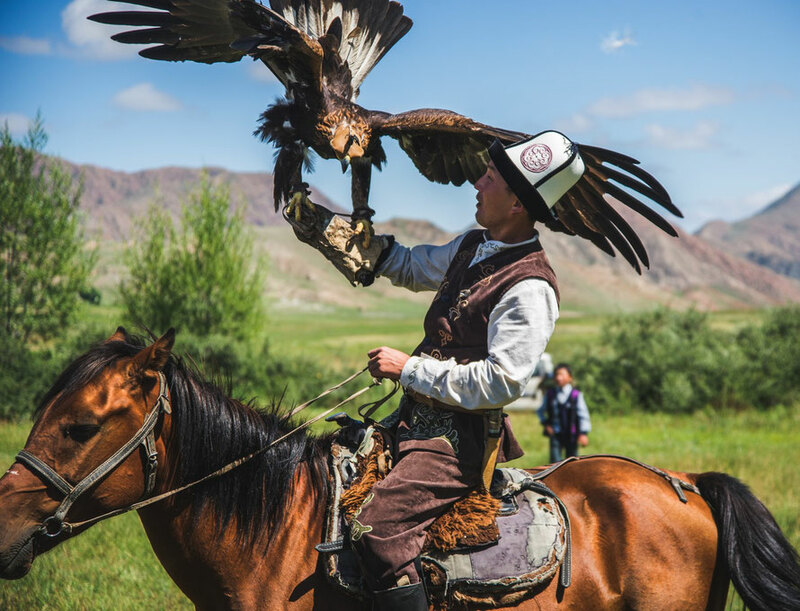 As old as two millennia, hunting with eagles is not only fundamental in nomadic Kyrgyz and Kazak culture, but in the past was essential to the acquisition of food and furs in the winter. I’ve been captivated by eagle hunting every since being directed to a video about it (below) five years ago. The balance between a hunters training and an eagle’s intellect, the raw power of its wings and grace of its talons, make the hunt feel like a dance between the symbiosis of man and nature —a primal friendship forced in the bitter winter of the steppe. 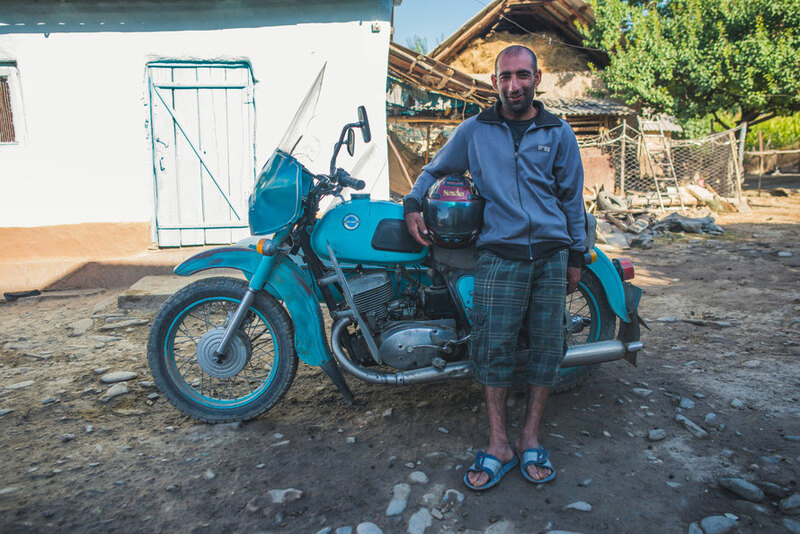 Today (August 20th) we set off for the Pamir highway in Tajikistan. The highway is the worlds second highest, and maybe most interesting, but it doesn't have much access to electricity nor internet. Posts will be a bit sparse the next week, and will focus on days in Kyrgyzstan and Kazakhstan; there is already a stack of stories waiting to be told and photos to be shown. Below is a map of our route toward Dushanbe for those interested, which is already being adjusted based on road closures. See you on the other side! Issyk kul is the eye of the Tian Shan range: a massive expanse of clear, inviting water sunk right between the mountains. In the morning haze the surrounding peaks blend and blur into the edge of the lake, sharpening and separating in the afternoon glow. 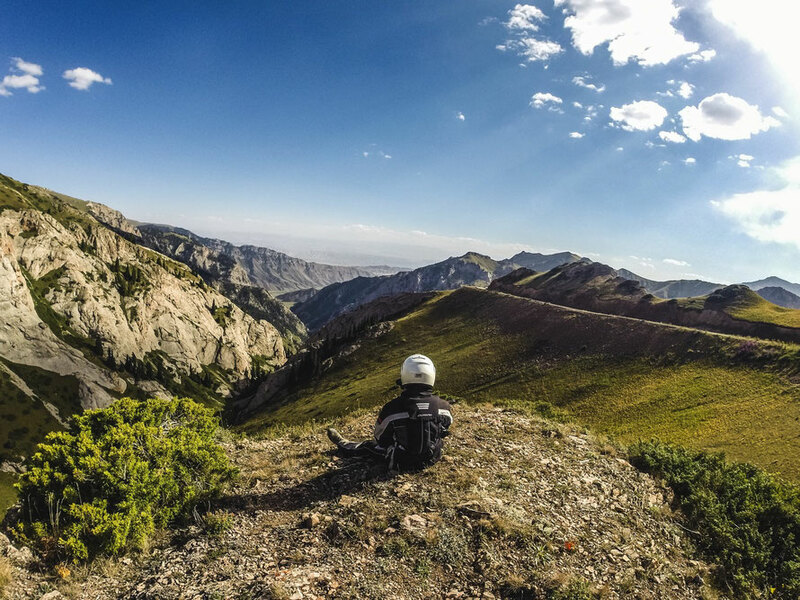 Issyk Kul is second largest alpine lake in the world, but the road around it is an easy and enjoyable ride, a series of stunning views on welcoming roads. 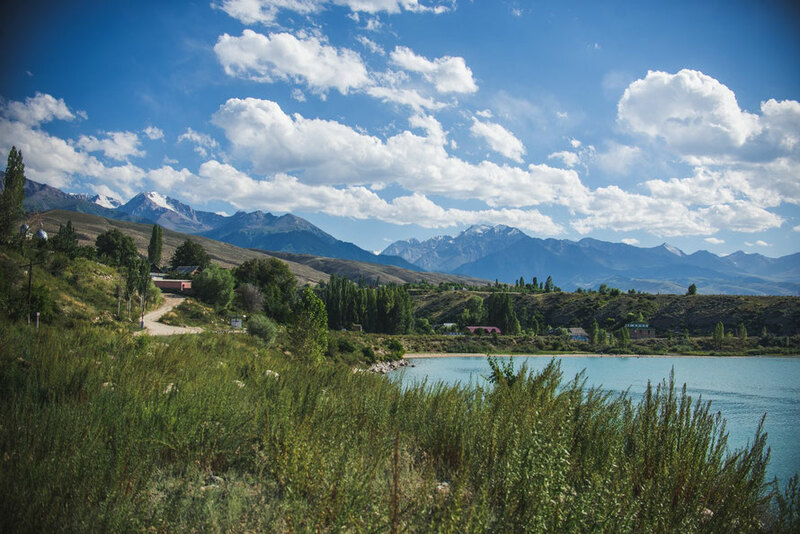 It’s a cruise made interesting by the decidedly different feel of each side of Issyk kul. The north is more of a beachside vacation; the east, an abundance of tall mountains and the perfect base for long treks; and the south a less-developed myriad of changing landscapes and shorelines. We take three days to loop the 440 KM around but it could easily be done in half that. 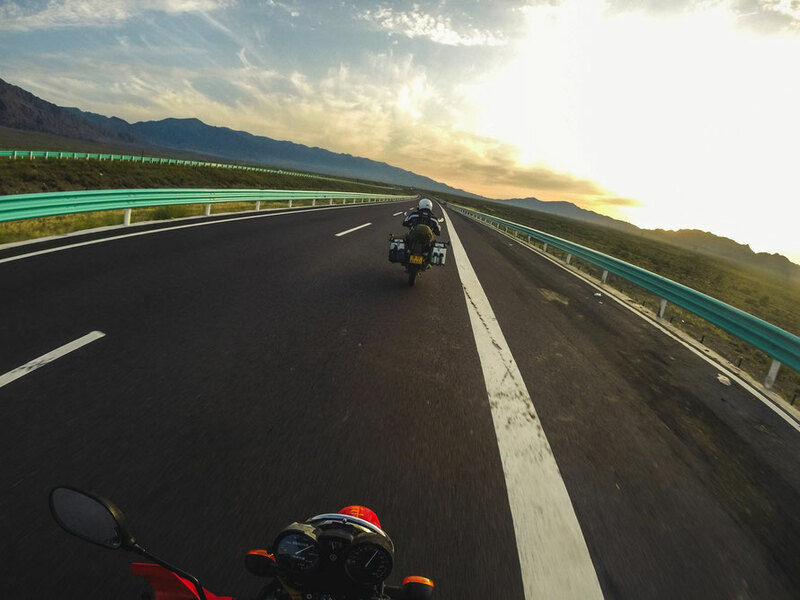 We arrive in Bishkek when it’s already dark having left Almaty in a flurry of early-morning goodbyes and an afternoon of rolling hills. The road out is perfectly paved and this time the border goes much smoother thanks to the help of an off-duty Kyrgyz border guard who happens to speak Chinese. It probably doesn't hurt that I’ve already been here before (see the bottom half of this post for that & more border details). 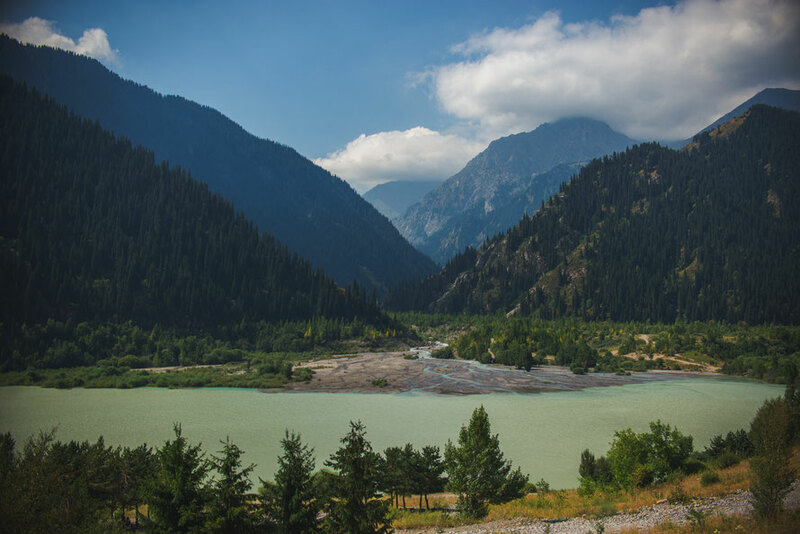 Almaty is surrounded by amazing nature and an excess of national parks on every side. We didn’t manage to explore as much as we should, but what we did was captivating in very different ways. To give you an idea of how different the scenery in one small area of Kazakhstan can be, I’ve written about two trips outside Almaty that we did in our time there, one to the east and one to the west. Waking up in Almaty is a dream. It’s quiet on the broad morning streets covered green with dancing leaves whispering in the summer breeze. We’re staying downtown, but here that term doesn’t evoke a repetition of towering concrete. 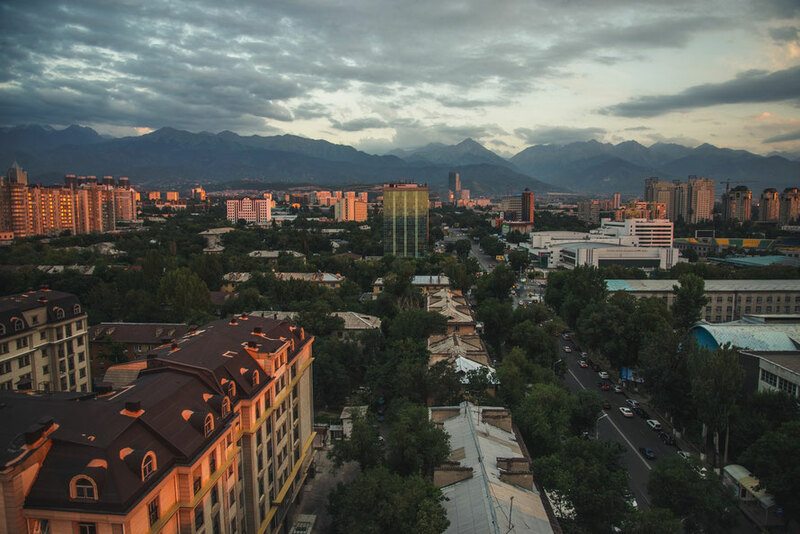 Instead, Almaty wanders out in a series of low-lying buildings and crosshatched square boulevards. Parks fill almost every third block, many adorned with busts of soviet leaders, and almost all pouring over with gardens full of roses every shade of the sunset. In the mornings on weekends and when the afternoon begins to slow into night, people fill the grass and the benches: families having picnics, young mothers huddled in knitting classes, pre-teens swimming in the fountains, and bashful couples intertwined on soft-lit park benches. The days last long and move slow. 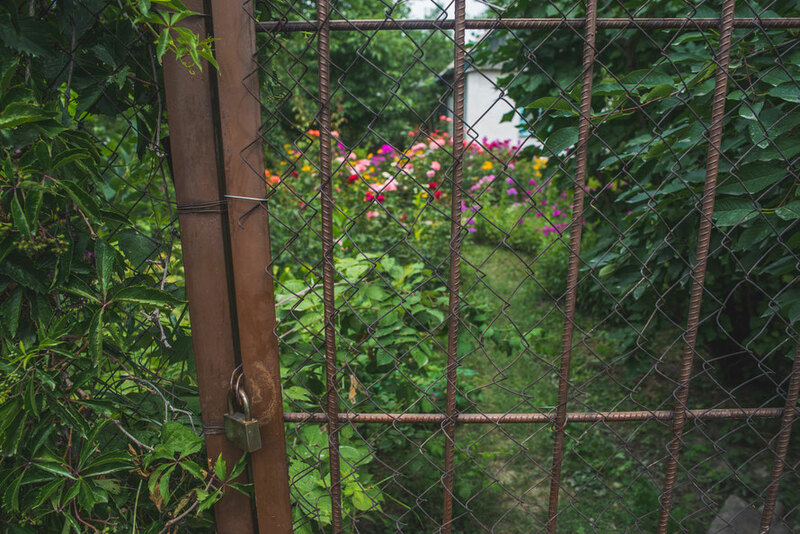 We spent 18 days in Kazakhstan enjoying the country while we did and re-did visa applications. The next couple posts will be a summary of our experiences and impressions from our time there, a great place full of great people. Almaty is only 300km away from the Chinese border but there's an entire world of difference in between. Maybe it should have been an indicator of how much things would change when the border guards asked Jie if he knew Jackie Chan (unfortunately no), but in a matter of hours we left a country we knew so well and were re-absorbed in to one that surprised us thoroughly. 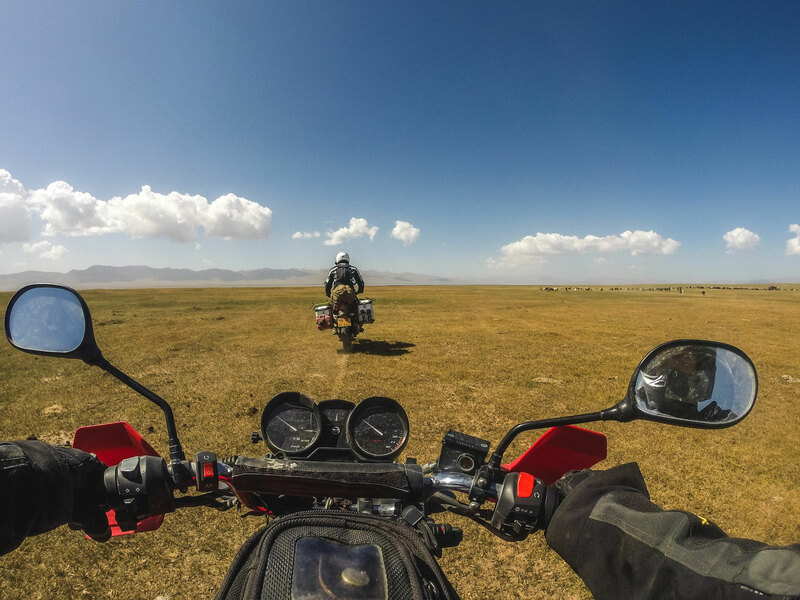 The road from Khorgos to Almaty is a series of small villages with tin roofs and broad open steppe where the wind tosses both the bikes and piles of sand back and forth across the road. This scene iterates constantly in different variations until you reach Charyn canyon one of Kazakhstan’s great geological wonders and apparently only second in size to the Grand Canyon. We don’t realize this until we get to Almaty. We’ve heard the name but we just cruise through the path that cuts the high edge of the canyon, not unimpressed but definitely not overwhelmed. After getting out of China by what seemed to be dumb luck, we just want to make it to the city as quickly as we can. We tried to cross the border from China into Kazakhstan at Korghos; it didn't work out at all like we thought it would. To explain why and to explain for other travellers, this post will be in two sections: our story, and suggestions from our experience. It may be a bit more logistical than our other posts, but hopefully it can help those of you who will try something like this in the future –and at least entertain those who wont. We get denied at the border; we are told its impossible to get the bikes out of China; we have a miserable couple days where we spend the whole day talking to border officials; we think the trip might have to change completely and come up with a bunch of other plans; we are sad; we get a phone call randomly one morning and then ??? we can leave. I promise it’s more interesting than just that, so I’ll try to explain as best as I can. Urumqi is a strange place: strange because it is concurrently both very different and very not different from the rest of China. Signs are in Uyghur, food choices are more diverse, military and police presence is ridiculously high, and there are more mosques than your average eastern town. 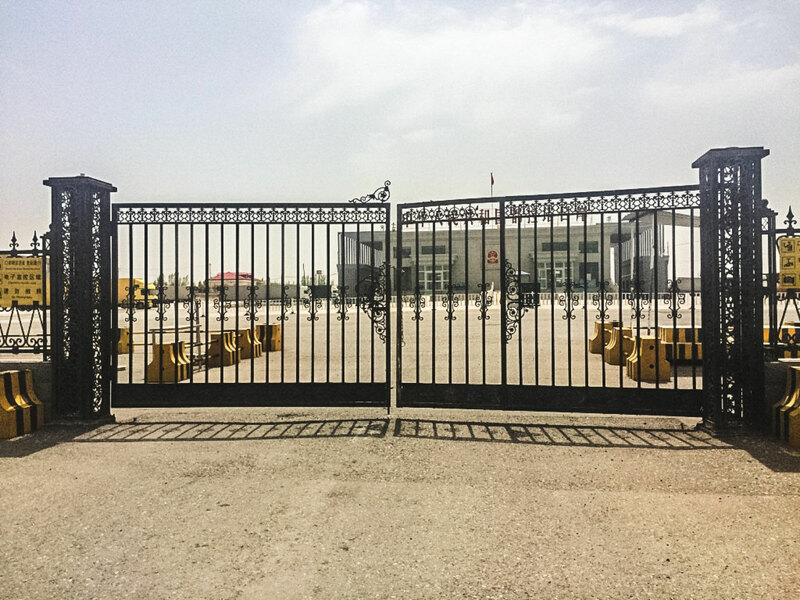 But had we not psychically driven ourselves from another part of Xinjiang into the city, it would be hard to tell that this is China’s final outpost in the west.